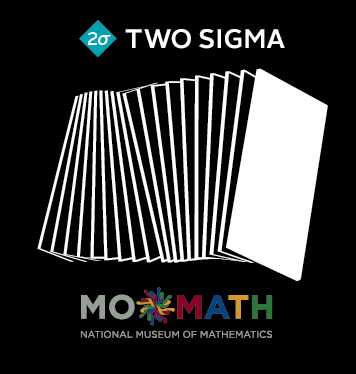 Join the MoMath technology team for a weekend of fun and creation, courtesy of Two Sigma. Get a behind-the-scenes look at the tech that makes the magic happen and a sneak peak at some of the exciting new projects in the works. Hack in teams to take on exhibit enhancement and visitor experience projects, or be among the first to experiment with new SDKs for two of the Museum's breathtaking exhibits, Dynamic Wall and Math Square. Winning projects may be incorporated into the Museum experience! Registration includes a free Hackathon t-shirt as well as breakfast, lunch, and dinner on both days. After Expressions, attend the 2017 Mathematics Of Various Entertaining Subjects (MOVES) conference on August 6 through 8. Learn more and register at moves.momath.org.